I have put together the top five products that I think are essential for everyone's skincare routine and wanted to share them with you! This is almost like a skincare recommendations as well because it's what I would say to my fourteen year old self with severe acne after having hindsight and figuring out what works best. I have also added a few additional recommendations at the end and overall have attempted to make this extremely beneficial and helpful so I hope you enjoy. A good cleanser is crucial in every skincare routine to sufficiently clean the skin and remove impurities. The biggest tip I can give about this skincare essential is to use the most natural product possible that works on your skin. You can start with Cetaphil and if you think that's too gentle on your skin, you could then begin trying out natural skincare ranges such as "Simple" or natural lines from brands such as Neutrogena and Clearasil who have both recently released more gentle products. The biggest mistake I made when first starting out with skincare was skipping on moisturiser because I had oily skin. The thing about that, and I have mentioned it before, is that your skin needs moisture and particularly the kind of moisture found it moisturizers. So when you take that away from your skincare routine, your skin begins to feel deprived and will begin to create it's own moisture in the form of oil, leading to overly oily skin. By using a moisturiser daily, it can manage your skins balance and keep your face moisturised but not oily. A couple of years ago, I learnt about the magic of exfoliation and how removing the dead layer of cells on the surface of your skin helps bring healthy skin to the forefront and regenerates skin leaving a soft, firm and glowy finish. To do so I first recommend a classic scrub, something that contains exfoliating beads that gently removes the dead skin without being too abrasive. The other alternative is an exfoliation machine such as the PMD which gives at home microdermabrasion treatments, an expensive investment but definitely worth it if you're serious about exfoliation. I wouldn't recommend using a PMD or harsh scrub with acne to avoid irritation and worsening of the condition. I have only recently added serums to my everyday skincare routine and have been absolutely loving the results that doing so ha given me. Serums are extremely different to a moisturiser mainly in the way that it soaks into more layers of skin and moisturisers deeper. Most serums will be targeted towards anti-aging but remember that we are not primarily using serums for their anti aging properties, although some more aged skins will love you for it. We are more so using them for their firming capabilities as well as the glow that they give your skin. A good eye cream is crucial because the skin under your eyes is extremely delicate and needs to stay hydrated to avoid wrinkles and aging. Considering the kind of ingredients that are used as fillers in cheaper eye creams, I think that it's worth investing in a good eye cream that's great quality. 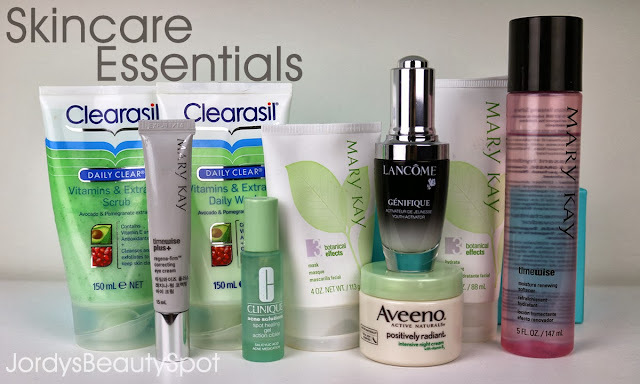 I personally love Lancôme, Dior or Clinique for high end eye creams but "drugstore" brands such as Mary Kay, Aveeno and Garnier have some great eye creams at an affordable price. Dr. Lewinns is the in between-er that has amazing quality but the pricing is in the middle of high end and "drugstore". Either way, you may have to go through a few eye creams to find one that you love and works perfectly for you. Masks: There is nothing better than relaxing with a nice mask on and the great this is that there are so many different variations of masks making the experience very customizable. Some of the options include; sheets, gel, peel or clay masks. The best part is that masks can be aimed at working specifically for your skin type so if you have oily skin then look for clay mask to soak up oil and if you have dry skin, opt for a moisturising sheet masks. Toner: I would only recommend this if you have extremely oily skin and suggest using it in combination with a really good moisturiser. Spot Treatment: This is great to have on hand to pop on any blemishes to dry them up. Prescribed: Last resort are prescribed medications such as a topical treatment (external) or an antibiotic (internal). So those are my top 5 skincare essentials, the products I think are super basic and that I recommend incorporating into your everyday routine if they aren't included already. *The Clearasil, Mary Kay, PMD, Aveeno, Lonvitalite and Lancôme products were gifted to me.